There are several hiking trails within the park, many of which can be accessed from a campground. 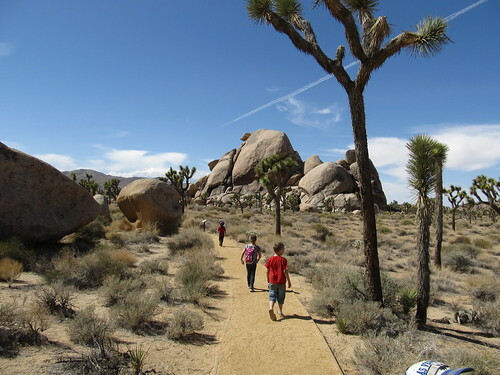 Shorter trails, such as the one mile hike through Hidden Valley, offer a chance to view the beauty of the park without straying too far into the desert. The park is popular with rock climbers and was originally a winter practice area while Yosemite Valley and other parts of the Sierra Nevada were snowbound, but later became an area of interest in its own right. There are thousands of named climbing routes, at all levels of difficulty. The routes are typically short, the rocks being rarely more than 230 ft (70 m) in height, but access is usually a short, easy walk through the desert, and it is possible to do a number of interesting climbs in a single day. The rocks are all composed of quartz monzonite, a very rough type of granite made even more so as there is no snow or ice to polish it as in places like Yosemite.